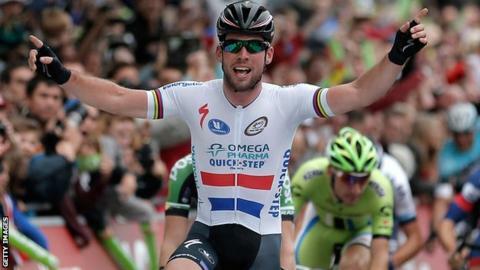 Mark Cavendish is to miss the Giro d'Italia as he plans his preparation for the Tour de France. The British road race champion, 28, will instead use the tours of Turkey, California and Switzerland to get himself ready for the 21-stage event. "As everybody knows, my big goal this year is the Tour de France, especially as it starts in my native country," said Cavendish. The Tour de France begins in Leeds on 5 July and ends in Paris on 27 July. Cavendish won five stages of last year's Giro d'Italia to win the red points leader's jersey in an event affected by torrential rain. He said he would be sorry to miss this season's event, which starts in Belfast on 9 May. "I'm saddened as it's a race that has given me great satisfaction in the past," added the Isle of Man rider, who finished fifth in the recent Milan-San Remo one-day race for his Omega Pharma-Quick-Step team. "But, with the Tour de France as my main objective this year, we had to make some choices." The Tour of Turkey runs from 27 April to 4 May, the Tour of California from 11 to 18 May and the Tour of Switzerland from 14 to 22 June.